It would make more since for it to be set in post TLK2. That would be advantagious with not having to work within existing continuity. The only downside I can see is that Kion (and the rest of The Guard) might stay stuck as cubs permanently. The way it is now I feel that we are almost certain to see Kion an an Adult. I hope so. I hope Disney goes the route of upping the show to Y instead of keeping it at a preschool level. I'd love to seee that happen, but i sadly don't think it will. Yeah, Disney could do a lot of good if they focused more on the main network, Disney Channel. I mean, during the 1990's, 2000's and somewhat today, Disney used to have mini television series for their popular movies. We did have a similar series before The Lion Guard there was Timon and Puumba. I am well aware of Timon and Pumbaa's show. I loved it, however I drove myself crazy trying to figure how it fit into Lion King continuity. I didn't fully get that it didn't until Lion King 1 1/2 came out. I feel Lion Guard dispite being aimed at a much younger audince is a much better show. Yeah, Timon and Puumba didn't make sense canonically since the plot just involved the two meeting animals like beavers. It also involved a human hunter and more ridiculously Simba being a lion forced against a Scar look alike in the coliseum by the Romans. Kion at least keeps to the wild of the Savannah whether than a wild adventure that serves as one of the destinations that Timon and Puumba pass through. I do like the hunter though since he serves as a reminder of a real life threat that threatens animals of the Savannah, poachers. Fantastic pic!!! SUPERBLY detailed, and really cute and sweet. LOVE IT!!!!! Are you currently taking commissions? If so, what are your prices and policies? Terrific! I'm definitely interested, and will check them out. Thanks very much! Wow, this looks so awesome!!! I love the background! It's so colorful and looks perfect! And I love how you drew the pride rock. 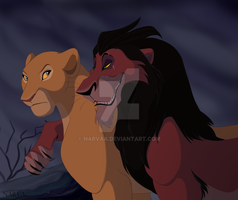 And Kiara and Kion looks sweet, too!